Many people agree that prayer is a central feature of spiritual life. But what is prayer? 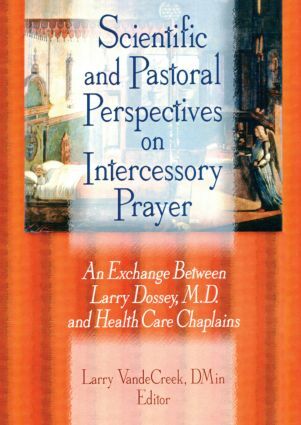 Scientific and Pastoral Perspectives on Intercessory Prayer: An Exchange Between Larry Dossey, MD, and Health Care Chaplains explores common questions and concerns about intercessory prayer, or the act of praying for the benefit of others, from several different points of view. Chaplains, priests, ministers, and clergy in the health care profession will learn how prayer is examined from sources other than traditional Christian views, such as parapsychology. From Scientific and Pastoral Perspectives on Intercessory Prayer, you will learn what prayer means to some chaplains and to their ministry and how prayer can make drastic changes in the lives of your parishioners, patients, and their families. Since Scientific and Pastoral Perspectives on Intercessory Prayer focuses on the cooperation between science and theology, you will discover that, in many instances, people believe that the power of prayer should be taken seriously. This text also shows you how the questions and functions of prayer are shared by everyone, despite religious differences or methods of praying. Encompassing research and personal experiences, Scientific and Pastoral Perspectives on Intercessory Prayer will help you answer questions about religion and its role in the lives of parishioners, patients, and clergy, as well as provide you with evidence to the positive and healing power of prayer.